From artists like veteran singer Arun Das performing in Assamese to food stalls serving local cuisine, and models sashaying down the ramp in their traditional wear — Mekhela chador, the opening day of Rongali Festival was all about the celebration of Assam’s culture. 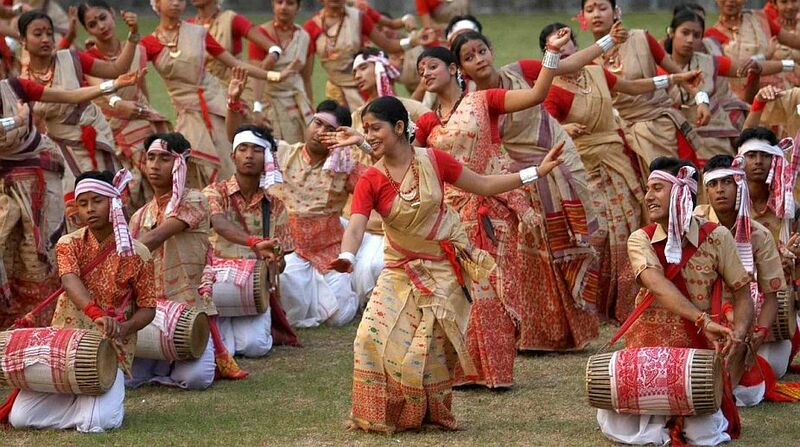 The fourth edition of the fest commenced on Friday at the Srimanta Sankaradev Kalakshetra. The day started with rock bands competing against each other. Some groups also performed folk dance. While they were entertaining the attendees with their energetic performances, others were gearing up to put up stalls. The food section offered a variety of options — multiple thalis, fish, chicken items and even sweet dishes. As the sun bid adieu, M Brothers band took charge. And so, they gave the audience their own rock version of Grammy-winning composer A.R. Rahman’s hit track “Humma humma”. They left the audience dancing to a Bihu song. The attendees continued to cheer. Why? Because they were thrilled to see veteran singer Arun Das taking the center stage. The 64-year-old strapped on a guitar and took charge of the microphone. He took the audience down the memory lane via his songs. “I started my journey in 1973. The songs that I sang were from that time,” Das told IANS after his performance. He feels happy to connect with youngsters through his music but feels there are fewer platforms for people of his age group. “I perform but the programmes are limited. Nowadays they want only young people ” he said. “The last time I performed was in August 2017,” added the talent, who would like fellow Assamese singers Zubeen Garg and Papon to collaborate with him. Next was designer Jimi Das’ show. Das’ collection was a bold one. It had off-shoulder short dresses, backless pieces and more. New designer Tania Ahmed’s collection, on the other hand, was all about women empowerment. “The collection is about warrior princesses. The theme is the empowerment of women. Northeast women are given enough power to choose what they want to do as compared to women in other parts of the country,” she told IANS about the range that consisted of dresses, tops, and culottes, slit gowns, corsets. “The silhouettes are western but the prints are similar to what tribals wear,” she said. Designer Swarnapori Phukan took a traditional turn by showcasing colorful Mekhela chador. “I am working on Assam silk. The designs are all handmade. I want to popularise our traditional wear. People outside Assam can wear them too,” said Phukan, who has found loyal customers in Punjab and Chennai. What clicks with the women who are not from northeast India? “Mekhela chador is more colorful than a sari. These are handloom items so they like to wear,” added the designer, who uses Kolki, orchids and Mayur designs for her creations. Designer Elina Talukdar had the perfect accessory for the outfit. Her bamboo jewelleries — long necklaces and earpieces in different sizes and shapes — with Mekhela chador seemed to be a match made in heaven. It wasn’t just people from the music, fashion and hospitality industries that took out time for the three-day fest. Assam Governor Jagdish Mukhi also attended the festival to inaugurate it. He expressed his happiness to be a part of the festival.